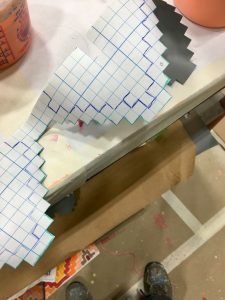 Tina Yager describes her steps for creating a woven-look groundcloth on a sample of Gerriet’s MALTA fabric. Gerriets International is a generous sponsor to the Guild of Scenic Artists. 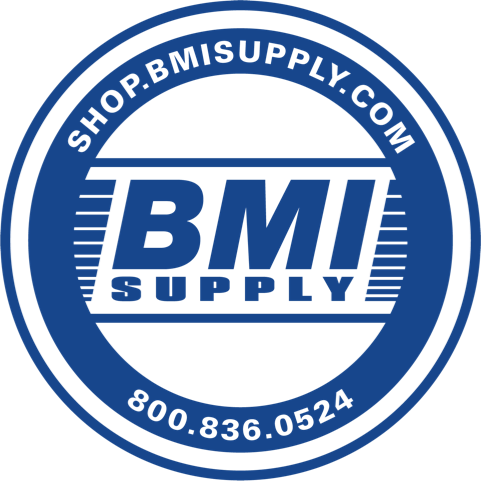 They are a theatrical equipment and scenery products company that provides fabrics, flooring, projection surfaces, and technical systems. Scenic Artists know them for textiles such as muslin, velour and sharkstooth scrim. As part of their sponsorship, they provided some samples for us to try out and review. In the box of fabrics they sent, I was immediately drawn to the neatly folded groundcloth material named MALTA. 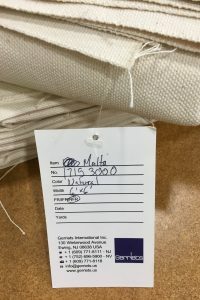 MALTA is a wide width heavy-weight cotton canvas that can be used effectively as a floor cloth, and is available in natural, white and black, and come NFR and FR. 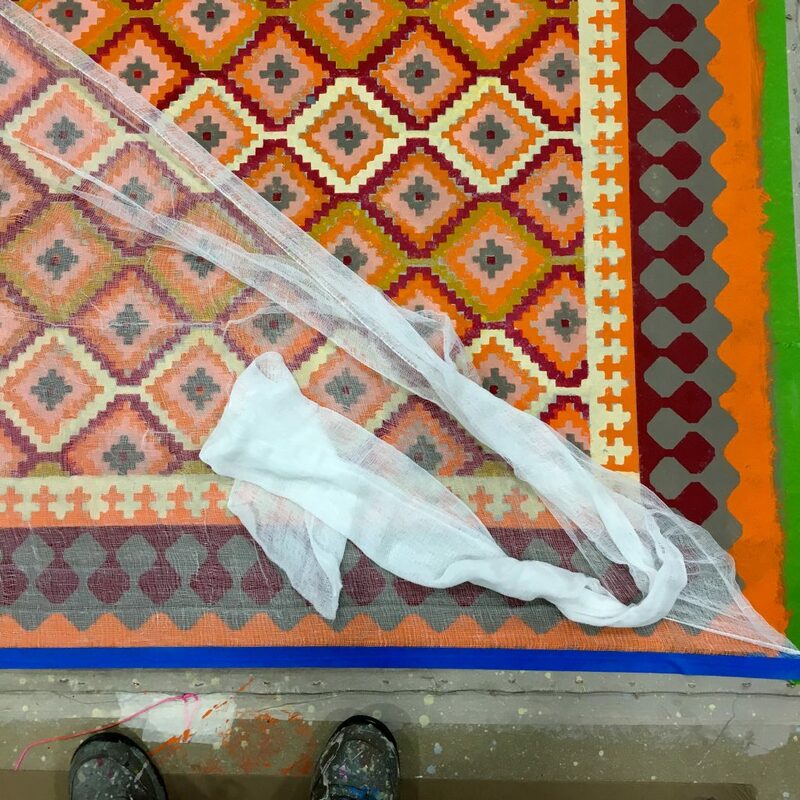 The 6ft square sample size of the NFR version was just right to offer a surface for a faux woven rug design, with plenty of test space to spare, and so the fabric chose the project. The sturdy weave and clean, smooth, tight surface was begging for a geometric design. My colleagues know that I often spend my time ticking out a tessellation on gridded paper while taking my notes; I love geometric patterns and abstract geometric art. 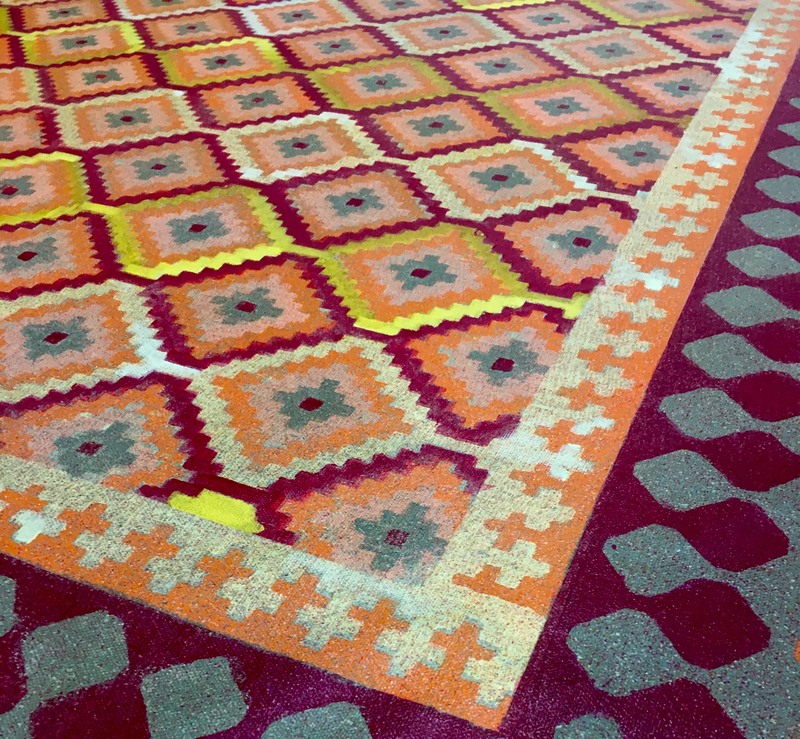 So, a woven rug with a geometric design was a natural choice. When I cut along the grain of the fabric, it was fairly easy to slide a scissors across in a straight line. I tested the strength by attempting to tear the fabric. Even with a snip on grain, it would not tear. MALTA carries a very tight weave and so I wasn’t expecting much shrinkage. However, because the fibers seemed awful strong and I didn’t want to risk pulling staples, I left a healthy amount of slack when sizing it. I sized it with a taupe color of Sherwin Williams Resilience with a big natural bristle lay-in brush. Resilience is an exterior grade paint that is aptly named and also comes in quarts, which is handy when you need those candy colors. My employer, VStar, does a variety of work in large scales and there are always interesting leftover products to try. This sample project was also made possible by the generosity of Charge Artist Stephen Michael, who graciously allowed me to park myself on the paint deck, raid his shelves, and go to town. Once my base was dry I did a coarse spatter of a neutral blue and yellow. Using tertiary colors can be an effective way to build visual texture in a neutral palette. On to layout, I knew this would be a good project for stencils. 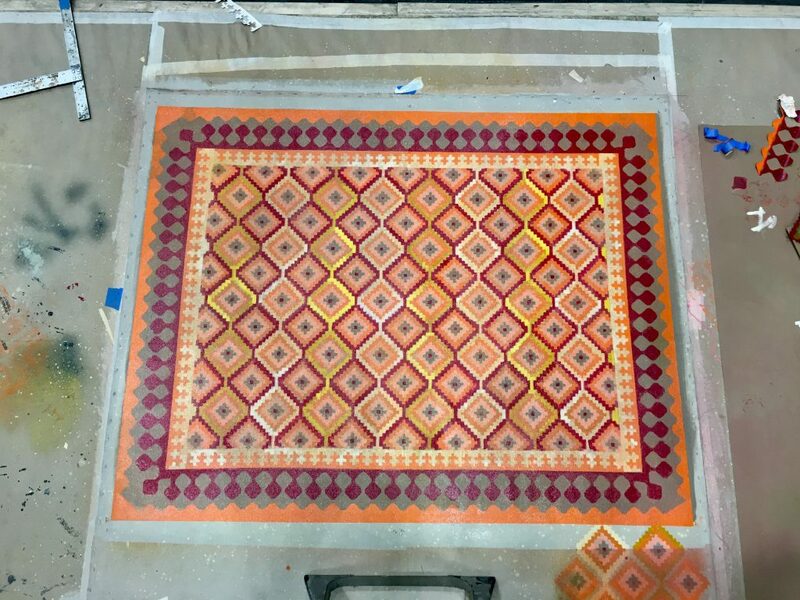 I found a remnant piece of an adhesive vinyl with a bonus gridded backing, making the stepped layout of the woven rug although a bit tedious, easy to layout and accomplish. I wanted to add a nubby cloth texture into the treatment in one step, so I used cheesecloth as an interference between my stencil brush and the surface. The weave of the cheesecloth works to “interrupt” the stippling effect of the stencil brush, leaving a conveniently woven pattern. The cheesecloth was generally squared to the stencil, though I wanted some irregularities so the result would look more natural like a hand tied rug. When it came time to start laying in color, I selected Nova Color for a few reasons. First, the colors are beautifully saturated and the heavy acrylic load makes for a durable and extremely flexible paint. Additionally, I chose Nova Color because while I have heard much about the product, I haven’t had a lot of opportunity to work with it. The paint and the MALTA fabric were a great partnership. After completing the multi part stenciling process and final toning and texturing, once again I used cheesecloth as a resist so that my toning spays would be in a gridded pattern. I sealed it with Lenmar’s Aqua–Plastic Waterborne Urethane (an old favorite), and glued the edges back with Rosco FlexBond glue. I’d feel confident using the MALTA canvas for any ground cloth application. I’m looking forward to digging into the box of samples and see what strikes me next! The Guild will be using this groundcloth at our booth for USITT 2019. Stop by to see it, and us, in person this coming spring in Louisville! This looks great. The report is nice and clear, giving all products used, representation. It is wonderful that the artist included the sample areas done on the cloth as well. Sometimes a scenic’s sampling is the meaty part of product creation plot. Good work!